Old Rishworthians lost 38-20 at Moortown in Yorkshire Two yesterday in spite of having the majority of the possession and dominating in the forwards. 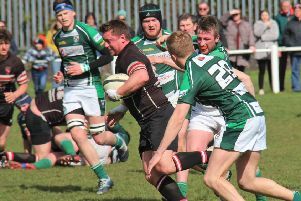 However, they were hit by breakaway tries and the speed of the home backs, Moortown crossing their line six times. Spirits remain high after they fought back with four tries after some thrilling play. As they were all in the corners, fullback Joe Billing had no chance of converting in a fierce gale, which blew across the pitch. Rishworthians played sensibly throughout, knowing that kicking was out of the question due to the wind, as the home side found out. The visitors did not start well. The pack was pushed off the ball at a scrum in the second minute and a home centre strolled through a weak tackle for the first try. Rishworthians came back strongly and two catch and drive attempts, after good lineout possession from Harry Collett, saw them rumble over the line only to be denied by the referee. They maintained the pressure and both wing Liam Phillips and No 8 James Clarke almost got over. Only long kicks with the wind relieved pressure for Moortown. On one occasion Rishworthians found themselves near their own line. They drove the ball 60 yards upfield and then into the home 22, before getting it out to centre Kurt Sutcliffe, who crossed the line only for the last pass to be given forward. Against the run of play, Moortown broke out and their speedy backs gained a second try under the posts, which was converted. When they did it again two minutes later to make the score 19–0 it looked all over for the visitors. They fought back again and from a tap penalty, centre Taniela Bakoso, who had another excellent game, almost got over. The ball was then shipped wide for Liam Phillips to dive over in the corner to make it 19–5 at half-time. Rishworthians started the second half strongly and both Clarke and Bakoso almost got over before Gerard Rollings completed the job for their second try. Straight from the restart, however, Moortown dispossessed the visitors and speed brought them their fourth try. Again Rishworthians came back and from a lineout near the home line, Bakoso suddenly emerged with the ball and dived over in the corner. It looked as though they could come back to win but two more breakaway tries sealed their fate. Rishworthians knew a fourth try would give them a bonus point. They harassed the home defence to win back the ball and Josh Kelly, who had his best game of the season, put in a long pass for left wing Anthony Shoesmith to touch down in the corner.